It’s been a tough winter for anyone having to be outside in Rochester. 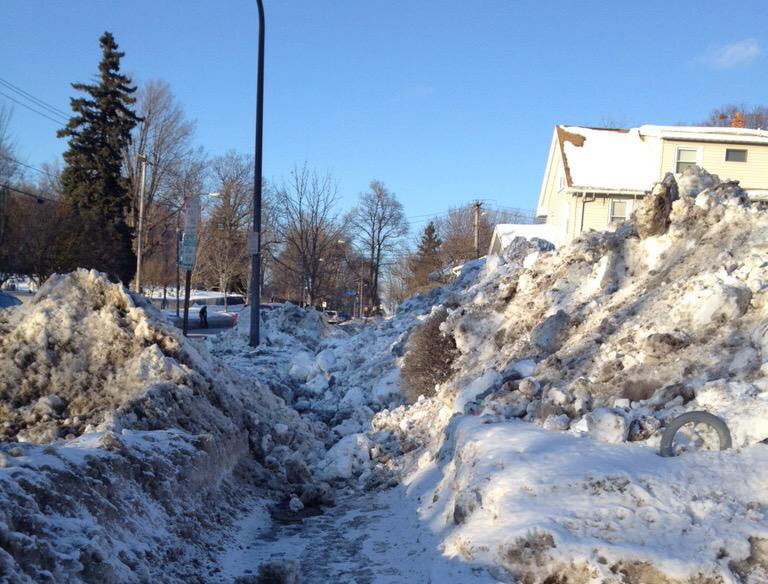 Transit riders have to hike over ice encrusted snow drifts and stand in streets, because their stops are buried. Pedestrians have to wear crampons to trudge across the uneven icy places where sidewalks once were. Those who are less steady, have things to carry or have to walk with assistance, have been forced to use the plowed streets. Cyclists hold on as they brave traffic, since the bike lanes are no longer there. And drivers cautiously turn corners blocked by snowbanks higher than their cars, taking turns on residential streets with only enough room for one car at a time. But the people walking out in the elements have clearly been given the lowest priority of attention.